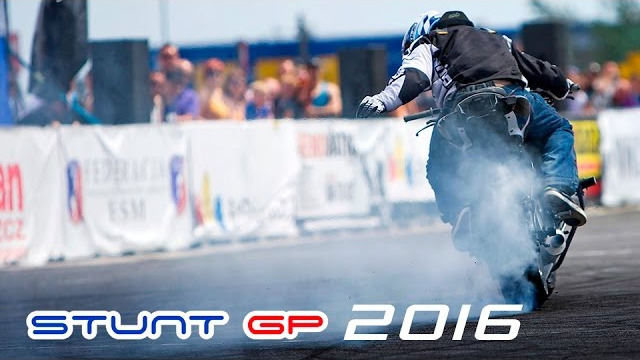 Stunt GP 2016 has become the strongest tournament in recent years, despite the small number of participants and the absence of top French riders. Korzen and Aras came to fight for the champion’s title, and the TOP10 names remained unknown until the final races. Marcin Glowacki (Korzen) relied on stability and continuity this year. He got on the new sponsored motorcycle a month before the competition, so adding some new tricks was very risky. He hasn't changed his program much since last year, which made it possible to drive both races well. 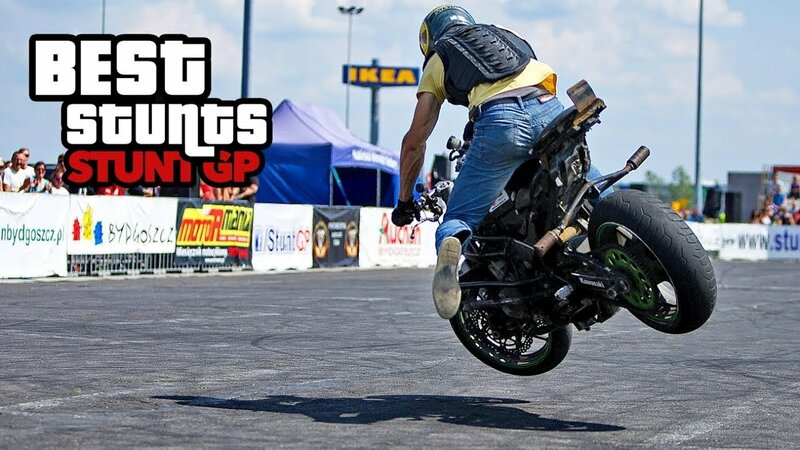 Marcin performed some complicated combinations, for example, in highchair: stoppie 180 - coaster - figure eight drift. His performance was a bright example of preparation importance. 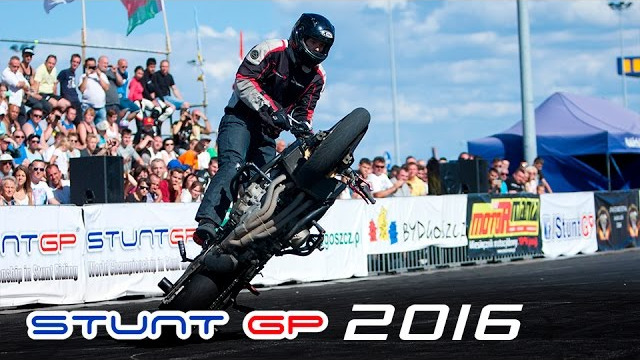 Arunas Gibieza wasn't in his best shape due to the multiple shows at the beginning of the season, but still showed some of the most complex modern stunts: no hands unicycle, special K spin, kangaroo 360, high tsunami. It is incredibly difficult to perform such a set of stunts: in the finals, the kangaroo worked out on the second attempt only, and he also lost control in the unicycle. In the wheelie category, Aras's performance looks modern and diverse. Slow combos and the most complex figure eight highchair no longer seem to be must-have elements of a professional freestyle: no less complex but more spectacular stunts are appearing. Several young talented riders deserved attention: Irmantas Jasevicius (22), Pawel Karbownik (23), Mike Jensen (23), and Joona Vatanen (23). Each had a wide arsenal of sophisticated modern stunts, and a unique style. Irmantas continues to improve athletic acrobatics and is trying to integrate it into other categories, for example, exit to highchair through a corner. This year, his stoppies looked better, and he did a good kangaroo. He also demonstrated the highest tsunami in the tournament! Pawel Karbownik is one of the most technical riders in the world. This year he tried to go into the very complex switchback spins on the wheel but he could not, though it worked when he was practicing. However, Pawel made a full switchback wheelie. He combined spin and no hands unicycle, showing everyone that slow technical tricks could be done quickly. 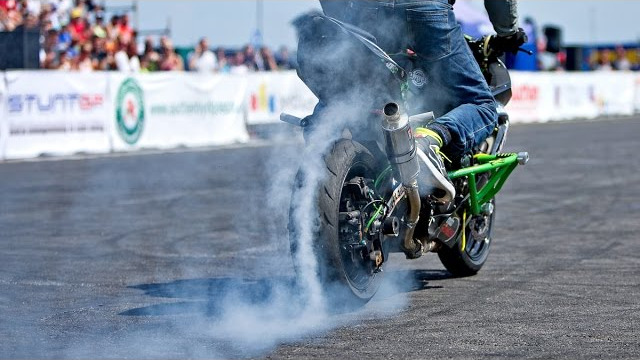 He did a confident kangaroo with exit to one wheel and a good switchback drift from burnout. Over the last two years Mike Jensen has improved his stunt skills so much, that after the semi-final he seemed to be one of the competition leaders. He confidently did the most sophisticated modern tricks: kangaroo 360, no hand unicycle, jumping through clutches with poses on the tank. In the finals, Mike fell and was unable to show his best, so he ended up forth. 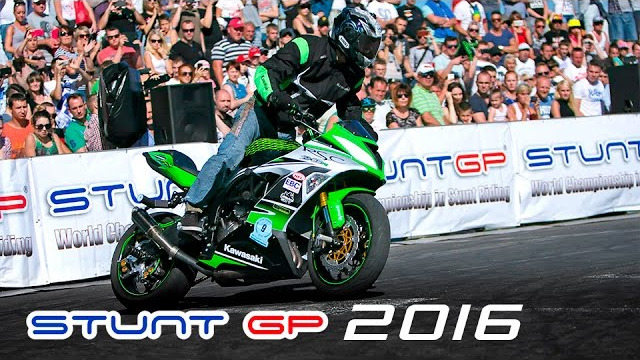 Joona Vatanen arrived at Stunt GP as the winner of Czech Stunt Day, which was held the week before. In Poland, the stage is much smaller, which created big problems for him. There was not enough room for a powerful GSXR. In powers, Joona had to steer up, and gas a lot in drifts in order to fit into the dimensions of the site - this made it difficult to exit stunts. There was too little time left for acrobatics, because this motorbike goes much faster than the others. As a result, Joona took the 6th place, but his great potential is obvious! 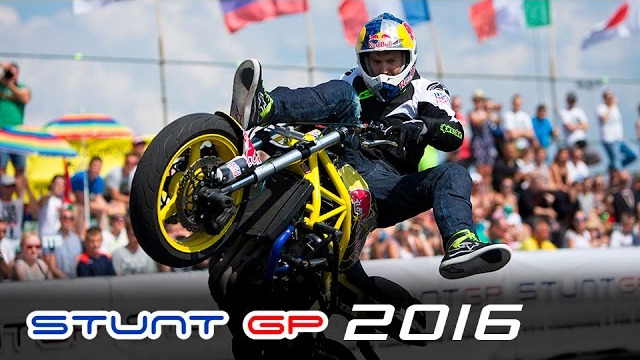 He managed to combine crazy speed style and complex stunts, and is a top world rider. 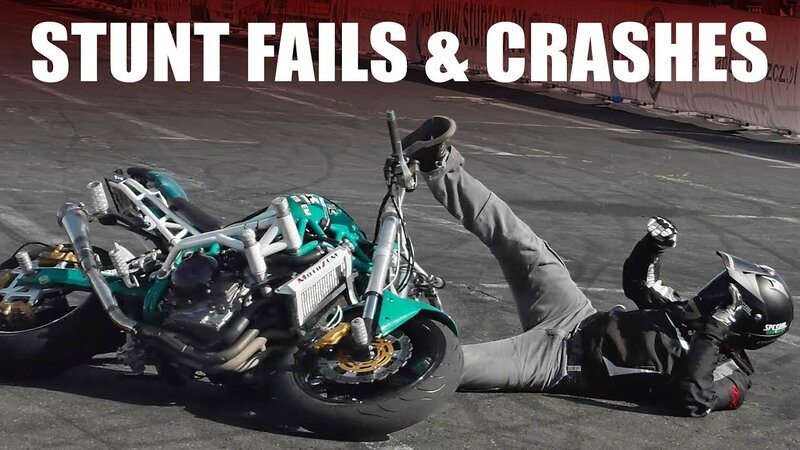 The most difficult stoppies with fast exits without rolls (the only one who did highchair 270), fast spins and special K with a jump on it - they all look aggressive and is not less difficult than many slow technical tricks. The post-soviet area was represented by six riders: Nikita Pokusay, Foma Kalinin and Alexey Kalinin (Russia), Vitaly Pasevich and Dmitry Trukhanovich (Belarus), Sergey Valivodz (Ukraine). 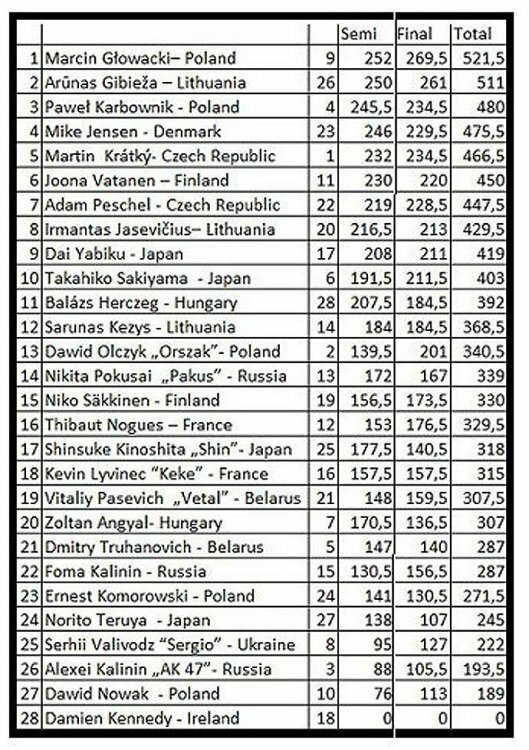 Nikita took the 14th place and will take part in Dubai tournament. He will be remembered with his difficult wheepie 360 and high tsunami! The tournament had a good competitive spirit, and the competition was very tight. It was difficult for judges, as there were many people who disagreed with their opinion. The stunts that a year or two ago could only be seen on videos on the Internet, this year the athletes did during their performances. 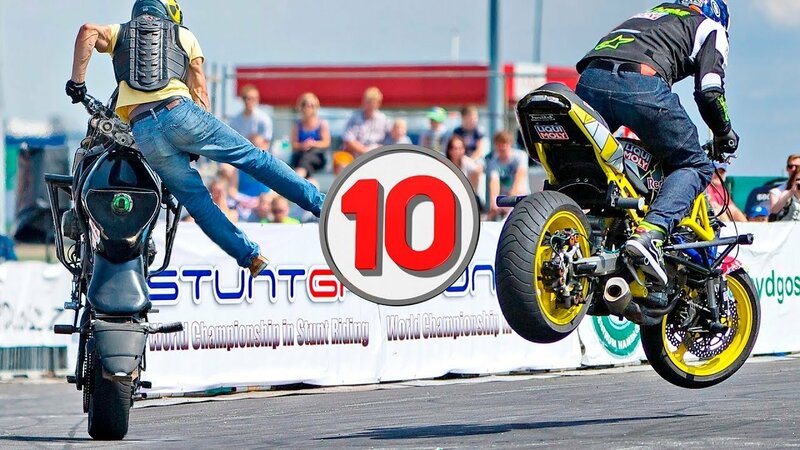 Some stunts that were considered to be difficult have now become the basic minimum, especially the categories stoppie, flat and switchback acrobatics are becoming more complicated.